Nordryggen mountain range. Map from fjellkjeden.no. This is my first blog post in a new series about expedition mapping. I'm currently preparing for a 4 week hike from Oslo to Bergen in August this year. I'll start in my hometown Oslo and walk through the wooden lowlands surrounding the city, Nordmarka. Then I'm heading for the mountains that will take me all the way to Bergen. 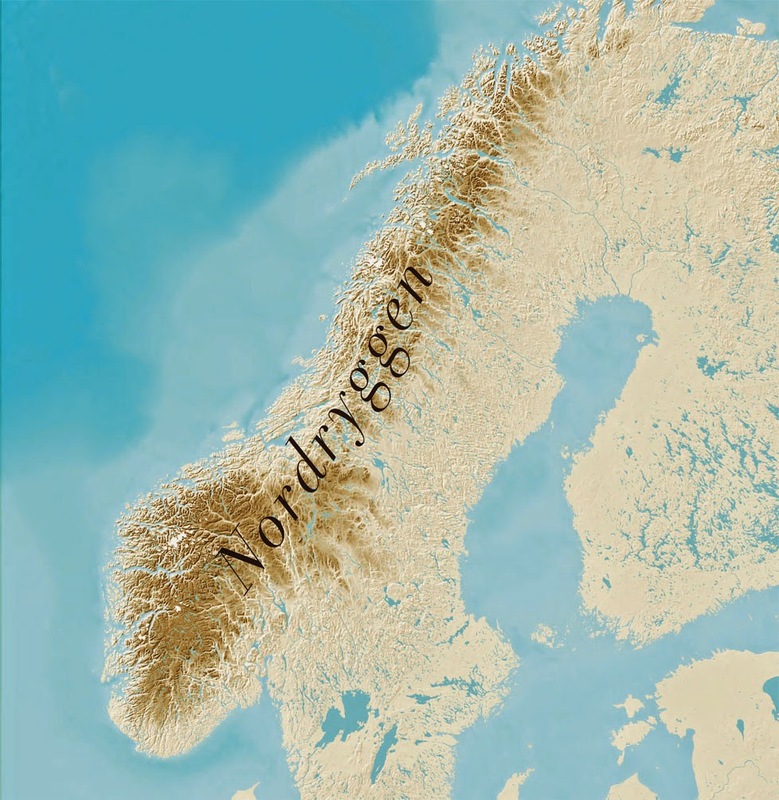 I'll be crossing Europes longest mountain range, recently named Nordryggen ("the north ridge"). Of course, maps will be important when preparing, while walking and to document the journey. I've started with a pile of good old paper maps to find the optimal route. I want to spend as much time as possible above the tree line, and it's clearly not the shortest route between the two cities. We have a great network of mountain trails and cabins in Norway, maintained by the Norwegian Trekking Association, and I'll use it's facilities when available. I've plotted the planned route on a Leaflet map, starting in the east and going westwards. There are markers for cabins, and where my tent is the only alternative. A couple of shop markers show where it's possible to get some supplies. I've used the Leaflet.MakiMarkers plugin from James Seppi. This plugin allows you to create map markers using Maki Icons from MapBox. The background map is provided by the Norwegian Mapping Authority. My code is of course available on Github. In my next blog post, we'll look at real-time satellite tracking. Would love to see a elevation profile of that hike!